I love embossing and working with shaving cream. For the shaving cream you add ink to it, stir it up with an ice-cream stick, and add card stock.Then clean off with a damp paper towel and let the background dry. Stampin’ Up, About Art Accents/Art Neko and Stamp Magick. Cranes, words, kids and women. My Score-Pal and My Ink’s double-sided tape. Ribbon, baker’s twine or words I write on the back showing the Mingle, group, date and my name. My Cuttlebug and Score Pal. Tell yourself you can do it even if it’s not as good as someone else who has been making cards 5 years or more. The more you try, the better you will get like I did. I didn’t know how good I had become until someone like (Margo) told me so. I have always loved the Oriental theme. I even have my bedroom done in an Oriental theme with three walls painted gold and the fourth wall painted red. It is beautiful. Oh yes! I would love to go to China, England, and where I could buy paper that is Oriental in theme. I would also like to find some beautiful rice paper. Too many! Other than OSA and it’s sub-groups I belong to CardsAllKindsandSizes, Show-Me-Mo-Rubber, BlindSwapATCs and ATC_Fun. Paper Craft and Card Maker. : ( No, not yet. Hoping soon. I love making bracelets, necklaces with beads. I love beading soft dolls or any soft images and have some in a glass door. Most of the Mingles I participate in. The OSA members will send e-mails telling about the Mingles and showing the cards. I love the e-mails telling how the card was made. I have no art background. Oh yes. I have used wire, labels off cans we cook with, candy wrappers, CDs and picture frames. There is no other website with the Oriental theme except OSA. No. I am a housewife and I cook every day, 3 times a day. 1. Attach a piece of plain card stock to the back of the CD just inside the edge. 2. 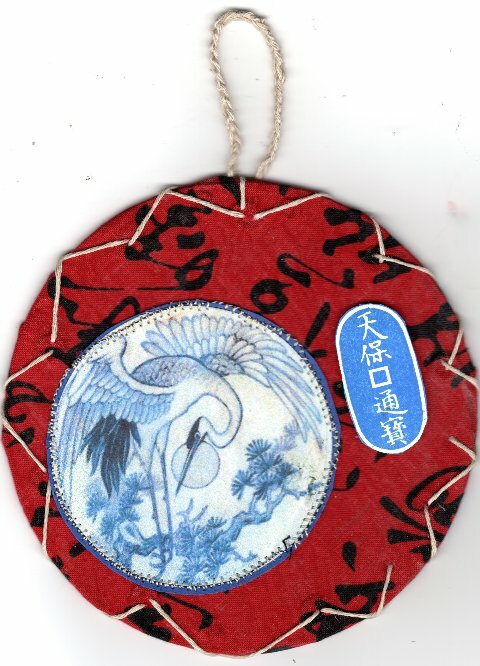 Take a piece of Oriental cloth and cut it into a 5 x 5″ circle. Glue on the back to the attached piece of card stock. 3. Punch 9 holes in the CD with a Crop-A-Dile around the edge. 4. Thread hemp around the CD. 5. Crochet a hoop to hang the CD. 6. Cut another circle of card stock in green, run it through an embossing folder and attach it to the back, over the material and crocheted hoop, to create a nice back. 7. Cut a circle of dark blue card stock the circumference of the circle. 8. Stamp a crane on white card stock in blue and cut into a circle just slightly smaller than the dark blue card stock underneath. 9. Sew a zigzag stitch around the edge of the white card stock into the blue. 10. Mount the circle onto the CD. 11. Stamp the oval Asian writing and punch or cut out. 12. Mount the oval Asian writing with foam tape . 1. Fold the solid paper in half to make the card base. 2. Place the patterned paper on top of the card base. You want it all the way to the edges of the card base. 3. Cut a picture out with a 3″ circle die cut and mount it on a circle of black card stock that is slightly larger than the picture. 4. 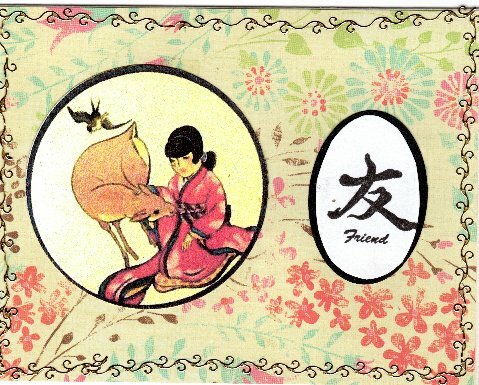 Stamp the word Friend (2″ long) and punch it out with an oval die cut. Punch out another oval in black a little larger than the one with the word. 5. Add gold star stickers around the card. Congratulations Mary! Enjoy your month in the limelight!!! Congratulations Mary.. a great bio . love your house too!!!! Congratulations Mary.. wonderful work. Enjoy your month!. Love your house too1!!! Congratulations Mary!!! Love your project and learning more about you. Enjoy your time as SAM! Congratulations to you Mary for becoming famous for a month as SAM of May 2012. Congratulations, Mary. It’s your time to shine! Congratulations Mary. Both your projects are beautiful. I love the floral background on the card. Congratulations Mary, I love your work and am always inspired by it. Great card and project. Congratulations. Loved your bio and your art samples are fantastic. CONGRATULATIONS for representing OSA for the month of May as SAM. you do beautiful work. I am from northern Indiana as well. Thanks for sharing and congratulations! hope you have a wonderful month.lovely art too. Thanks Mary for your bio…so nice to get to know you! It really is amazing to see how we progress in such a short time…looking forward to seeing your work often! Enjoy your well-deserved month as SAM!